A rare posting indeed. Some of the coldest air of the decade and possibly all time for some locations will filter into the area by Monday. A weak clipper system will pass mainly to our north on Saturday which will help to set the stage for extreme cold, straight from the North Pole to come roaring in starting Saturday night. Most of the front passes through Sunday leading to dropping temperatures across most of the Midwest during the afternoon. 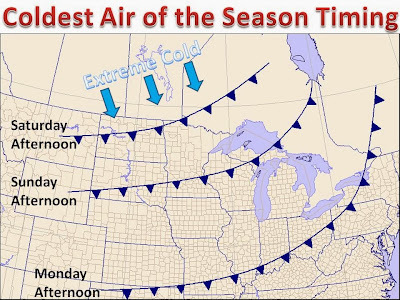 The coldest of the days looks to fall on Monday. Here you see a map of 850mb (about a mile above the surface) showing the extent of the cold. For a simple perspective, the white on the map is the lowest the color scale can go, and its even colder than that!! -30+ degrees Celsius. In fact this is what we call the "Polar Vortex." 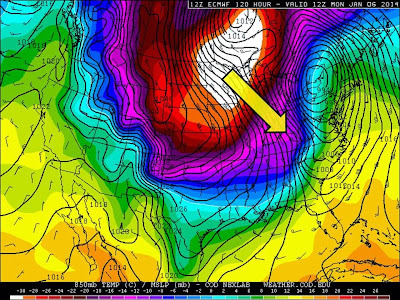 Usually this feature sits on the North Pole, spins around the globe and traps such cold in Northern Canada and Russia. However, on Monday it is poised to move south into the United States, and dominate our temperatures for a few days, before sizzling away Wednesday and Thursday! Now for the numbers. 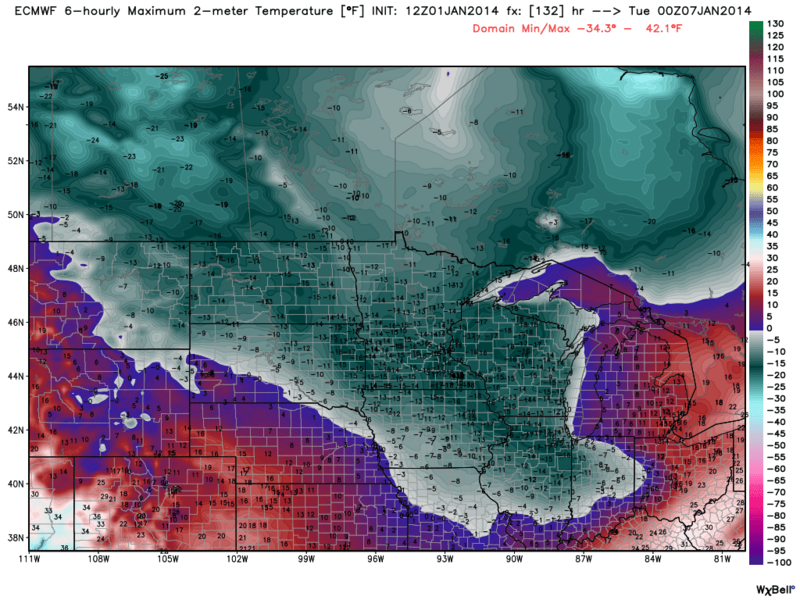 Lets start with what will likely be the coldest day for most places, Monday. On the left you see the 12z EURO model run displaying what this computer model has for high temperatures on Monday. Much of these are records. And no, these are not wind chills, they are actually HIGH temperatures. With winds in the 10-20mph ranges, wind chills will be substantial, with widespread wind chill warnings likely during this time. Expect multiple schools to shut down as dangerous "feels like" temperatures overspread the Midwest. Now we have made it to another historic portion of this post. 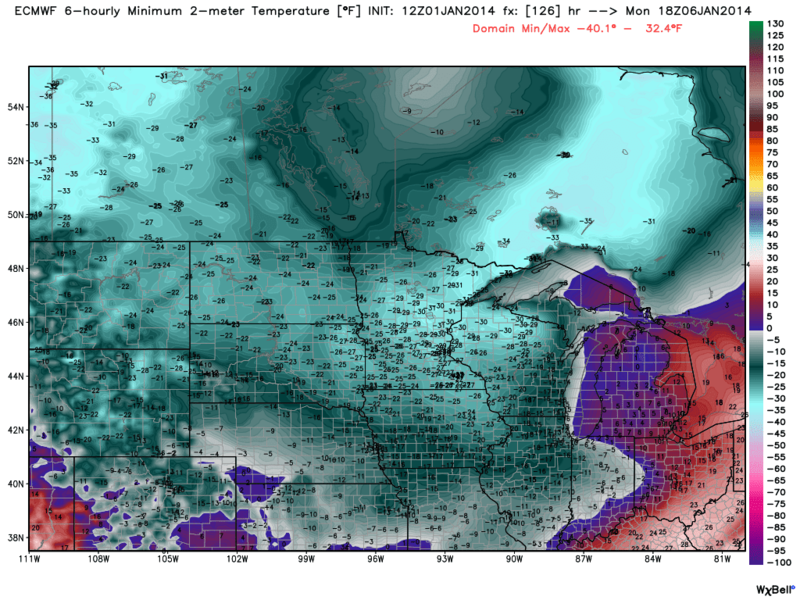 On the right you will see the 12z EURO forecasted low temperatures Monday morning, or Tuesday morning. Many of these numbers are all time record lows! Low temperatures are tougher to forecast this far out, as clear skies and light winds will be the determining factor as to how cold it can get. 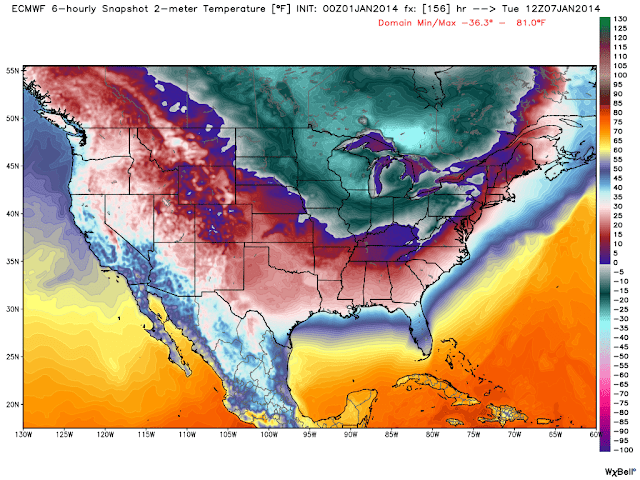 So the map on the left is one solution as to low temperatures. Be sure to stay tuned for updates, and plan accordingly if you are out and about during this stretch!